A portrait of Ilex when eight years old, the son of Rostrevor (out of Valonia), thought to show Arthur Nightingall up and the trainer John Nightingall, the first of the Nightingall trainer dynasty, beside them. In 1890 Ilex was winner of the 52nd Grand National held at Aintree. The horse would have it’s racing career ended by injury, but would be retained as a hunter and raced with hunts around the Surrey region. Painted in oil on canvas, signed and dated "J. Dighton 1892". 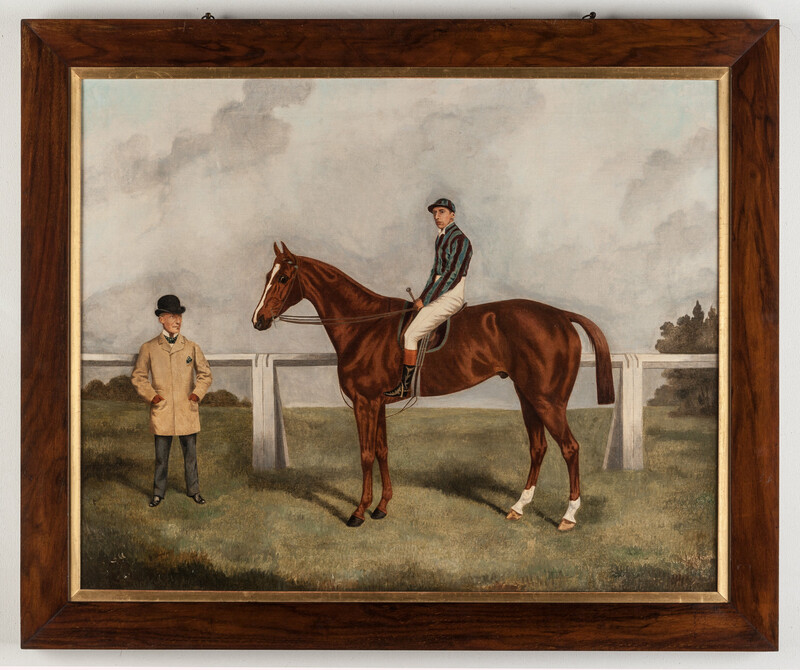 Joshua Dighton (1831-1908), born in Worcester, the second son of Richard Snr, is perhaps best known for the portraits of jockeys which he produced. Joshua's earliest work is an equestrian portrait of Fulwar Craven of 1845, in the collection of the Cheltenham Art Gallery. He worked in Hammersmith, Merton, Wimbledon, Pimlico and Battersea and as with all three generations of the Dighton dynasty, produced mostly watercolour portraits.